Hello! So, if you don’t follow me on social media (I’m @nicsnutrition on Instagram, Facebook & Twitter!) then you won’t have yet heard the news that I’m pregnant.. hurray! 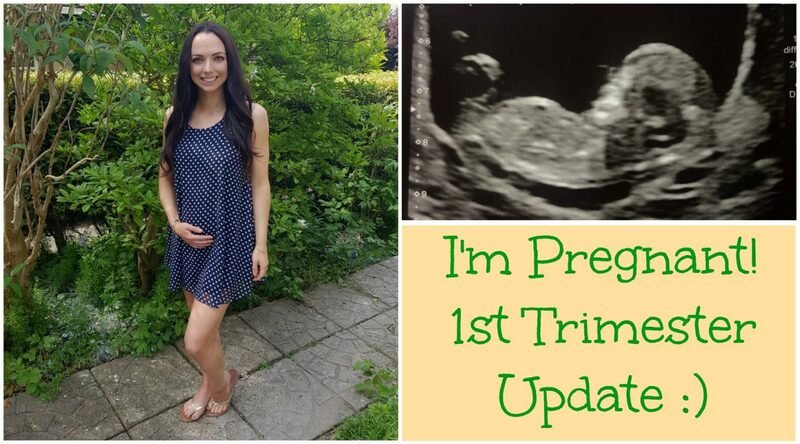 I’m 15.5 weeks along as I’m typing this blog post and so far I’ve posted two videos on the first part of my journey (scroll down to see them!). The first trimester was rather strange; I was already half way through it by the time we found out we were pregnant (5-6 weeks in!) and I was REALLY hungry as well as being extremely tired. I felt sick (but I never actually threw up) whenever my stomach was empty, which meant that I had to eat from the moment I woke up and then every 2 hours after. I also had to have a lie down after I got home from work, but still kept up with my Monday to Friday ‘at home workouts’ – even though I kept them short on some days! I also tried to squeeze in a walk on my lunch break; if anything to get some fresh air. Week 12 was probably the best week of my pregnancy so far; as well as it being my 32nd birthday, my husband Oliver and I saw our baby at the first scan! It was such a surreal experience and despite it triggering a few emotions, as the week went on I started to feel less sickly and tired (hurray!). Our next scan is at 20 weeks, which is a longer scan of the organs (and we get to find out the gender then too!) and at 16 weeks we get to hear the heart beat on a doppler. In case you’re interested in following my pregnancy journey in more detail, I’ve set up an Instagram specific account; @mummynutrition. My account is aimed at anyone, but specifically women who are either thinking of having a baby, who are pregnant or who have had children, and I really hope you find it useful! I’m posting 2-3 times a week on the main Instagram feed and then daily on Instagram stories; I’m posting everything from what I’m eating and drinking to nutrition and fitness tips, as well as the books that I’m buying too! Today I also posted my first pregnancy related ‘What I Eat in a Day’ video; I talk you through everything that I ate last Saturday, along with a few pregnancy related tips along the way; again I really hope you find it useful and interesting! Thank you so much for all of your lovely comments so far! Next Post How to get the MOST out of your body!